I bought this album solely on the recommendation of music critics. Let’s face it; we’ve all done it. Sometimes you think ‘Yeah, I see what the fuss is all about,’ but sometimes, as is the case here, you just don’t. I’m not sure why I found it so hard to ‘get into’ Blue. 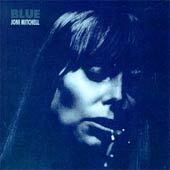 Perhaps it was the grim front cover (is Joni asleep, drunk, or both? ), or the album’s opening line ‘I am on a lonely road and I am travelling, travelling, travelling’, which to me was like a less charming Out On The Weekend by Neil Young (Blue was released a year before Harvest, but I listened to Harvest first, so there). Whatever it was, it took a long time for this album to gel with me. When it did, however, I certainly found Blue to have its moments. On tracks like River, and A Case Of You, Mitchell gets everything right, and it’s a treat to take in the gorgeous instrumentation, rich melodies, and beautifully poetic lyrics. One the whole, though, I do feel that Blue suffers from a lack of variation. All the tracks seem to meander along at a similar tempo, and Mitchell’s soprano voice sometimes soars a little too high and becomes shrill and ear-splitting. Worthy of a listen, if only to decide for yourself if it deserves its ‘classic’ tagline.